Porcelain ball jointed doll. Size - 35 cm. Overglaze painting, wig is silicone-based, hinge receivers glued with skin, doll stringed with elastic. Glass eyes. According to my information: It seems that Anastasia started making dolls about 2011, at first she did them out of Flume, then in 2013 she made the release of polyurethane dolls, and finally, in the first half of 2014 appeared her first porcelain doll. 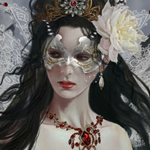 I absolutely fell in love with all the dolls of this artist - it was love at first sight! To my great happiness, I was able to adopt one stunningly beautiful porcelain doll. I still can not believe that this happened in reality, not in my fantasies! The second member of of this stunning family duet artists - Sergey Lutsenko. 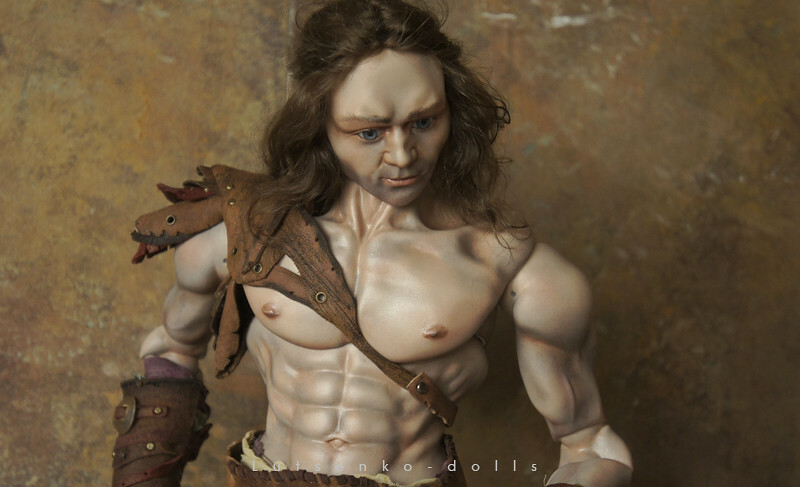 He skillfully paints the porcelain beauties, which makes his wife, and he is also a great sculptor who independently creates stunning porcelain maledolls - real brave brutal mens! Well, my friends, I hope that I can infect you with my love for these dolls! I am a big fan of these dolls too -I have been following them on Flickr. Oh these dolls are lovely. In particular I am very fond of the little redhead doll. On the warrior, I love the sculpting of the muscles and the stunning painting--wonderful! Thank you for posting! I've been enjoying following this artist as well. I agree with you, the female doll body looks very soft and flexible. They are very realistic looking. These artists' work has come so far even since this thread was started. I am just loving the way Sergey paints freckles, like nothing I have ever seen on a doll, especially in porcelain. They seem skilled at creating both light and dark freckling, so realistic. I love the clothes they have too, so detailed and realistic looking. The body has a double hip joint now too! Their work is just so beautiful and realistic, I really love the unique style of these two artists. Their dolls seem like such strong empowered characters! Just look at her! Fabulous! She is awesome. I love her hair, outfit, everything. Imani and Anna wip video,part 1. I follow Lutsenko dolls on Instagram and they always post little videos of WiP and I love them! So intricate and detailed. Yes,i love too to see the wip videos,how wonder come true. I've been watching their videos frequently. I especially love the clip of their cat playing with thread on the table while they worked. 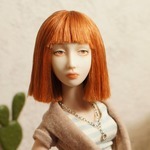 Their latest resin dolls are so lovely. I just don't want to buy a resin doll with all the talk of yellowing. I would be so sad to see something like that happen. Hi all Here are some recent photos of my darling Martha (a porcelain bjd by Lutsenko Dolls) made by very talented photographer Dmitriy Zorin. I really amazed how different and much more expressive photos are if made by professional photographer.